Hi, I am Francesca Moore, from New York. I attended Pratt Institute in Brooklyn and received a Bachelors of Industrial Design with a concentration on Fine Art Ceramics. I also did Post-Baccalaureate study in Fine Art Ceramics at the University of Massachusetts, Dartmouth. In 2009 I made a drastic career change, leaving the world of art and design to work in the healing arts. I received my AOS in Massage Therapy and Advanced Personal Training Certificate from the Swedish Institute in New York. I am a Licensed Massage Therapist and a Certified Strength an Conditioning Specialist through the National Strength and Conditioning Association. I started at AOMA in Winter of 2015 and will officially graduate the Master's program in Fall 2018. I started working on my Professional Doctorate degree concurrently and hope to complete that coursework in 2019. What are some of your other interests/hobbies outside Chinese medicine? My husband and I have 4 small kids, ages 6, 4, 2 and 1. We moved out to the Hill Country last year and hope to be able to spend more time enjoying nature. We love to hike with the kids and some day soon I hope to get back to cycling and kayaking. What made you want to study acupuncture and Chinese medicine? My experiences as a young designer in a high paced firm, quickly ascending the ranks, left me feeling out of balance, sick and miserable. Finding Chinese Medicine and working with a wonderful practitioner changed my entire being and gave me the new direction of working to help people improve their health. In the State of New York, half of the massage therapy training required is Five Element Shiatsu.Most of my instructors were also acupuncturists or students of Chinese medicine. Chinese medicine concepts and Five Element theory were well integrated into my education at Swedish and I knew when I completed that training that I would become a student of Chinese Medicine some day. Ironically, one of my last design projects was a hotel in Beijing and my firm just finished a project in Chendu. Please describe your top accomplishments since starting the program! I passed my Herbal Board exam on the first try! My youngest son also turned 1. Keeping my children alive while being a student was definitely an accomplishment! What did your AOMA education mean to you/prepare you for? I have met so many wonderful people at AOMA! The connections I have made with other students and practitioners have been invaluable. I feel well prepared to provide high quality, patient centered care once I step out into the world as a licensed practitioner. AOMA has also prepared me for a lifetime of learning. 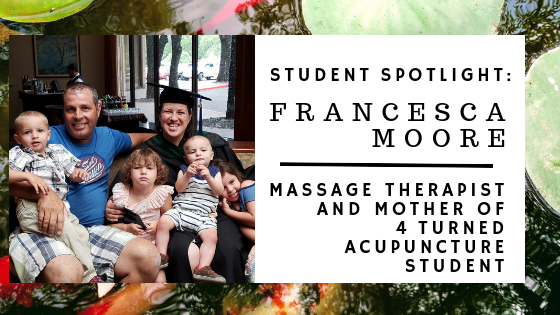 I know I have only scratched the surface in my studies of Chinese Medicine and look forward to narrowing my focus and continuing my studies to specialize in TCM Pediatrics and Gynecology as well as Oncology. What, if any perceptions of Chinese medicine have changed from when you started the program to now? Many of the OM practitioners I worked with in NYC were Classically trained students from a particular lineage who painted a picture of TCM as inferior to their traditions. It's clear to me now that it's all the same medicine. What is your vision for the future of healthcare/medicine and your career moving forward? The Bravewell Collaborative's definition of the integrative medicine approach, really resonates with me. I strongly value the partnership between patient and practitioner throughout the healing process and I trust the body’s innate response and ability to heal itself. As medical providers, we have a responsibility to consider all factors that influence health, wellness and disease. We may not be able to affect change on them all, but when treating diseases of the body, we should consider how the mind, spirit, community and environment relate to causes of illness as well as treatment strategies. We should be aware that each of these factors is one piece of a larger puzzle for affecting change. I hope to practice in a fully integrative setting where I can collaborate with biomedical practitioners and practitioners of other CAM modalities. What advice would you give to recent or soon-to-be graduates about to enter the field professionally? Familiarize yourself with board exam topics and work on a study plan as early as possible. There are a few topics of study I wish I hadn't glossed over and a few other that I could have put on the back burner until after completing the licensing process...and stay on top of your portfolio! They aren't kidding! AOMA is celebrating its 25th anniversary in 2018. Please tell your fondest memory of your studies here, and also feel free to give your Anniversary wishes! One of my most formative experiences at AOMA was as an observer in clinic with Elizabeth Fordyce. A patient came in crying and had been dealing with excruciating nerve pain for several days. Elizabeth came in to check on her, inserted one needle and the pain STOPPED. It was incredible to watch and showed me the power of this medicine! Want to learn more about the Master's Program at AOMA? Contact the AOMA admissions office! Subscribe below to receive instant, weekly, or monthly blog updates directly to your email inbox.